What's At Stake In The Mid East? 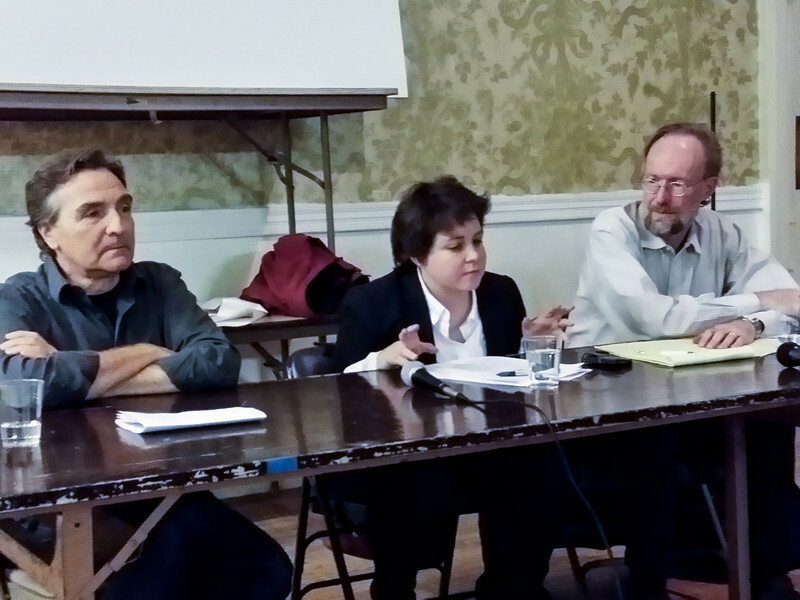 Panelists included Zachary Lockman, NYU Professor who teaches & writes on Middle Eastern history, politics and the role of the US in the region, Maya Mikdashi and David Wildman of theÂ United Methodist Church’s Human Rights & Racial Justice Committee and frequent traveler to the Middle East & Afghanistan. Before the discussion began a half-hour video from PBS’sÂ Frontline program was projected. It showed the horrendous impact on children that has resulted from the war in Syria. Attempting to give an overview of the conflicts and tensions that are roiling the region as well as examining U.S. policy in the region, the panelists delved into recent developments in Egypt but also discussed the myriad problems stemming from the occupation of Palestine, civil wars in Lebanon and Syria and ongoing conflict in Iraq. David Wildman, United Methodist Church.